Part002 - Employees of Asbestos and Asbestic Company Ltd.
0.50 m of textual records. - 277 photographs. - 15 postcards. - 1 architectural plan. William G. Clark was born in Aberdeen, Scotland on 29 October 1902. His family immigrated to Melbourne, Quebec in 1907 and then moved to Asbestos in 1908. 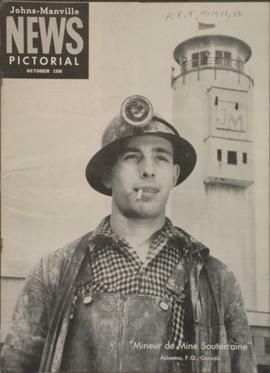 He went to school in Asbestos and Richmond and began work with the Canadian Johns-Manville Corporation in 1922 as an apprentice in the machine shop. He remained with Johns-Manville until his retirement in 1967 and he died in Richmond on 17 August 1999. Over the years, William G. Clark collected printed material and many photographs on the history of the Asbestos region. The collection contains source material on the history of the Asbestos region and on the development of the asbestos industry in the 19th and 20th centuries; it is also a source of information on the Johns-Manville Corporation, the life of William G. Clark, and includes an architectural sketch of the St. Andrew's Presbyterian Church in Asbestos from 1945. Among the materials are memoirs written by William G. Clark on his life and the town of Asbestos. The collection is comprised of the following series: Le Citoyen Historical Sections (1971-1980), Periodicals (The Asbestos Producer and Johns-Manville News Pictorial) (1948-1976), Photographs ([1897? ]-1981), Miscellaneous Documents (1940-1971), and William G. Clark ([197-?]-2003). The documents were donated in 1986 by William G. Clark. Additional documents were donated in 2016 and in 2018 by John Millen. The documents are in English and in French.